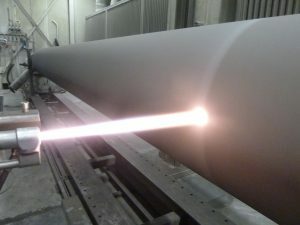 Depending on the process thermal spray coatings show a significant degree of porosities. In a corrosive environment these porosities may lead to the complete failure of the layer. Sealing with the right impregnant may overcome this problem in most cases. JELN has developed a great variety of sealers which match the requirements of thermally sprayed layers; irrespective of the process (flame spraying, APS, HVOF etc.). The parameters as viscosity, chemical composition and surface tension have been adapted in a way that the sealers perform well in the salt spray test and the practice, respectively. Some sealers modify also the surface properties or even improve the wear resistance of the layer. Specimen which has been sealed with Nano-Seal HLE after 700 h salt spraying without any corrosion. 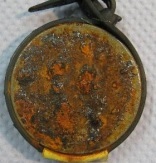 Unsealed specimen after 3 days in a salt spray test. Below you find a list of our standard impregnants in the field of thermally sprayed coatings. Special sealers as water-based ones are not yet mentioned. Please contact us if you are interested.